After recently moving some college Sims into a campus house that has its own swimming pool, I came to a sudden realization: Sim State University doesn't have very many swimming pools or other opportunities to go swimming. 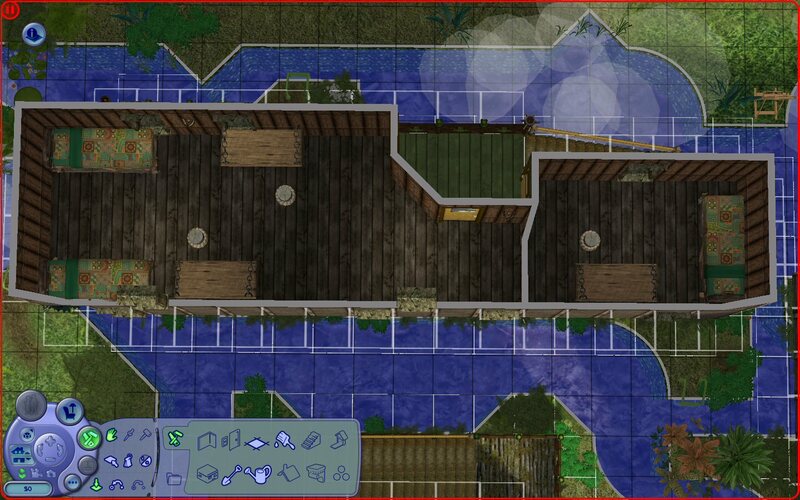 Somehow, that turned into a "flooded city" idea where Sims would have to go everywhere by swimming. 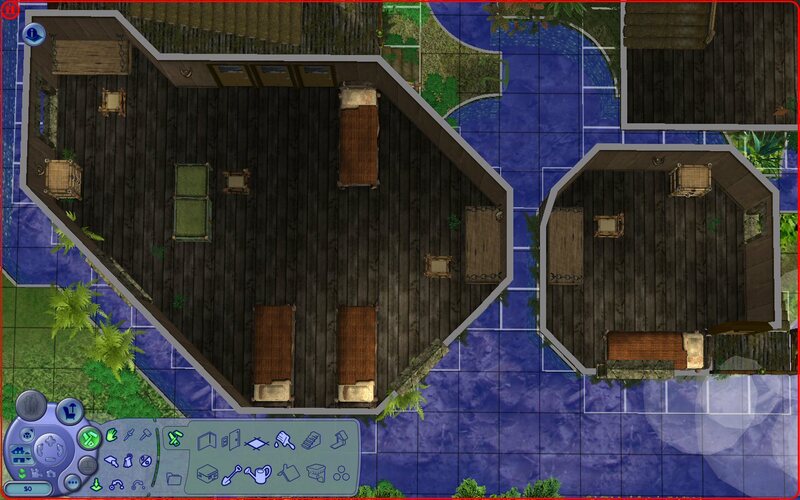 But then I decided that one dorm set in a bayou would be enough. Let it never be said that I am devoid of mercy. 1) Look over Sim State University (or whichever active University hood I'm playing) and decide where I want to place the new lot and what size it should be. 2) Open the University hood that I created specifically for building virgin Dorm lots, Residential lots and Community lots for Sim State University (or whichever University hood I'm playing with). 3) Find a suitably flat patch of land (which is most of the hood), place the empty lot, build it and convert its zoning to the right type (Dorm, Hotel, et al). 5) Package the lot, move it to my Lot Bin and place the lot again. I now have a copy of the lot in my Lot Bin to be placed again and again, anytime and virtually anywhere. 6) Switch to the active University hood and place a copy of the lot where I had wanted to place it. 7) Open Create-a-Sim and create some Simmy guinea pigs to put the lot through its paces, looking for any problems with the lot. 7a) If any problems are found, move the test Sims out of the lot (if it's Dorm or Residential) or simply leave it (if it's Community). 7b) Make changes to fix the lot as needed, changing the lot's zoning if necessary. 7c) Make note of what I did, switch to the original lot in the Zeta hood and make the exact same changes to it. 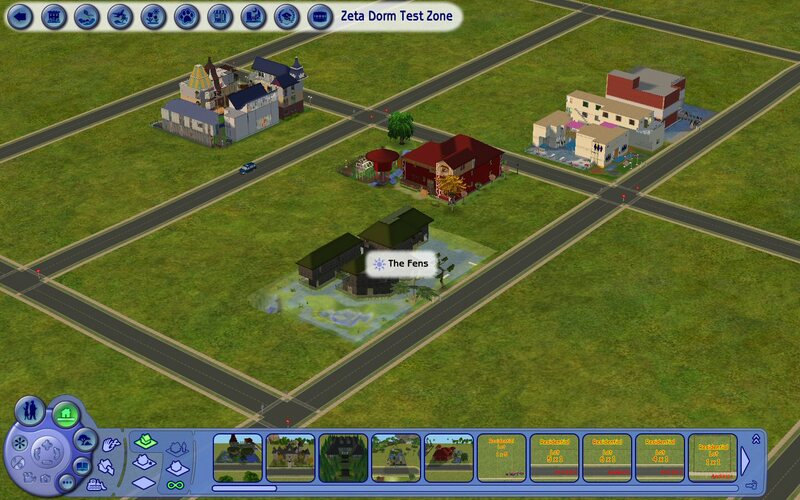 7d) Send the Sims back to the lot in the active hood and run the lot through its paces again. 7e) If the lot's too far gone to be fixed, bulldoze everything and start from scratch. But that's strictly the Last Resort option. I'm the hopeful sort! 8) Once everything meets my satisfaction, it's time to finalize and Package the pristine, never-graced-by-Sims clone back in the Zeta hood. So that's how I'm doing things with the dorm that I'm tentatively naming "The Fens." It's right next to Castle Von Carstein because all the water in the castle's moat has to come from and/or seep out to somewhere, right? It might as well be a swamp, a wetland, a bayou or something similar. 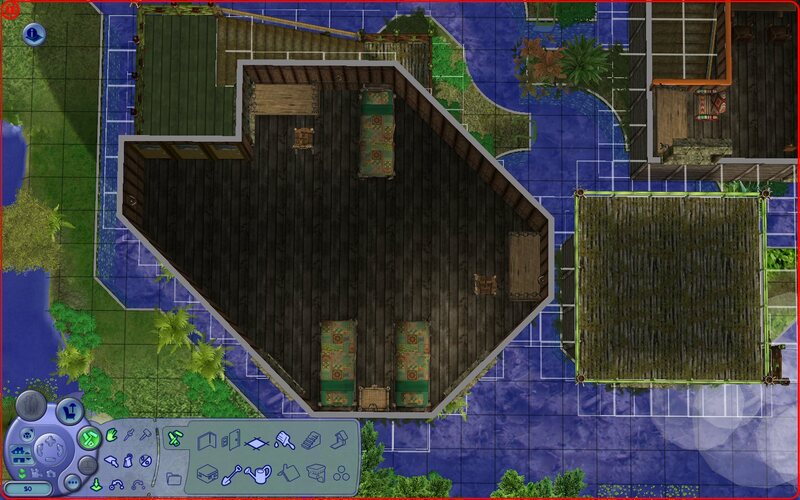 The lot is mostly one big swimming pool with grassy-looking walls and a muddy-looking floor. 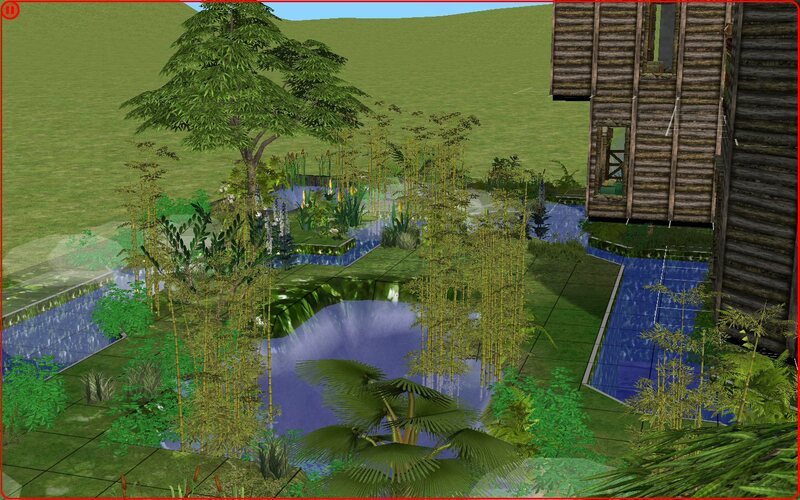 Here's one of the points where Simmy students can enter the lagoon. I forget where I found the 1x2 "rug" that's a bunch of discarded clothes (with seven or eight recolors to change the appearances of the garments), but I'm glad to have it. I wish that there were a way to change the color of the water on one lot. Sure, there are mods which change the water color for your entire game, but I don't want those. Wouldn't it be nice if water could be normal Aqua Blue in one lot, Algae Green in another lot (like this one), Blood Red in a third lot, Magma Orange in a fourth, and so on? A channel (created with the Miscellaneous > Swimming Pool tools) passing through two fishing holes (created with the Terrain > Water tool). 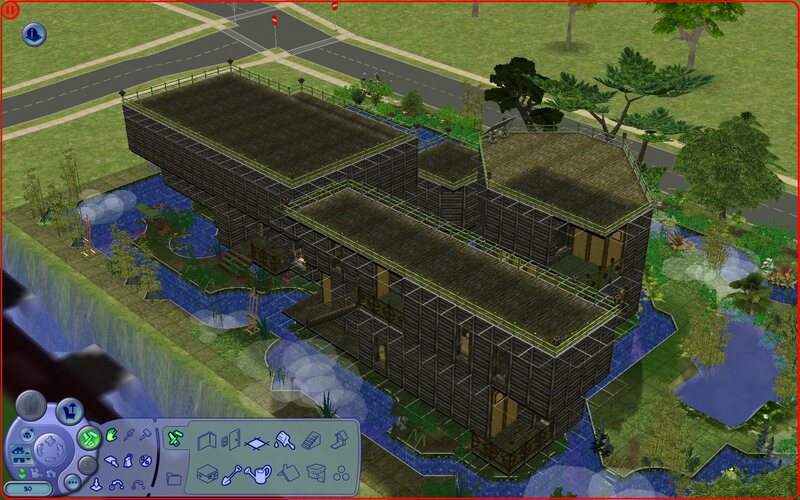 Supposedly, there's a way to merge swimming pools with the Water Tool to create lakes, ponds and creeks that Sims can swim in. But I never tried it for myself, and trying something is one of the best ways to commit the process to memory. So I forget how it goes. Maybe I'll Google it up soon. The "Big Shack" on the largest island. The Big Shack boasts the cafeteria, the study, the recreation center and the latrine, complete with two sinks, two toilets and four communal showers. The lot has enough lodging (and dorm doors) for 14 students, so I hope that the Big Shack is big enough! 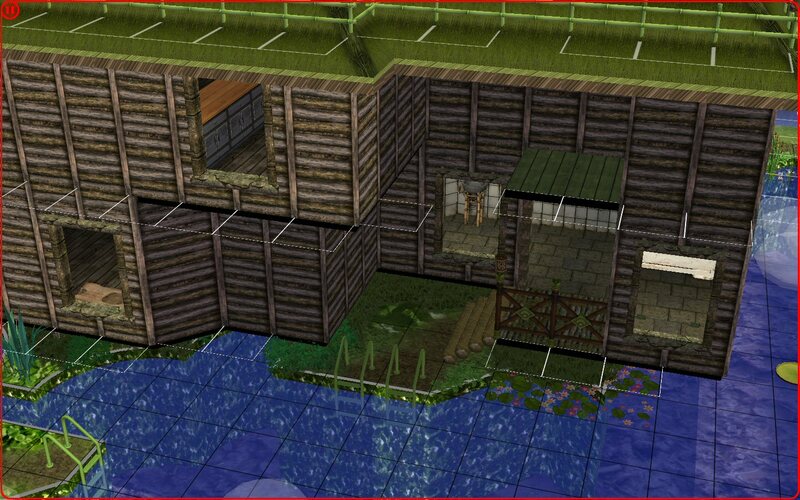 The "Papa Bear" Dorm Shack, with two rooms (one stacked atop the other) accommodating three students each. 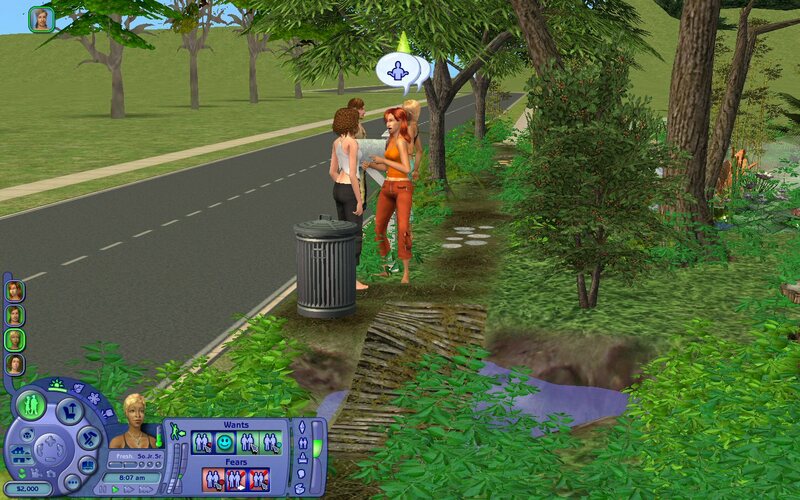 Don't put your Sims here if they don't like having roommates. The Big Shack, First Floor. The Big Shack, Second Floor. So the lot should have whatever the students need for skill-building. It has two bookshelves for Cooking, Mechanical and Cleaning, a TV and a kitchen (also for Cooking), a microphone and an easel for Creativity, two mirrors for Charisma and a chessboard for Logic. With the way that dormies can slob up all the plumbing fixtures, the latrine and the cafeteria should provide plenty of opportunity to build Cleaning too. They're in the middle of a giant fargin' swimming pool dressed up to look like a lagoon, and they must swim through it! If they don't have Body 10 by the time they graduate, then I have failed as a lot builder. Also, the wooden crest on that low wall around the stairs looks a bit bright. Maybe I should change that. Papa Bear Shack (1 room, 3 students) and Baby Bear Shack (1 room, 1 student), First Floor. 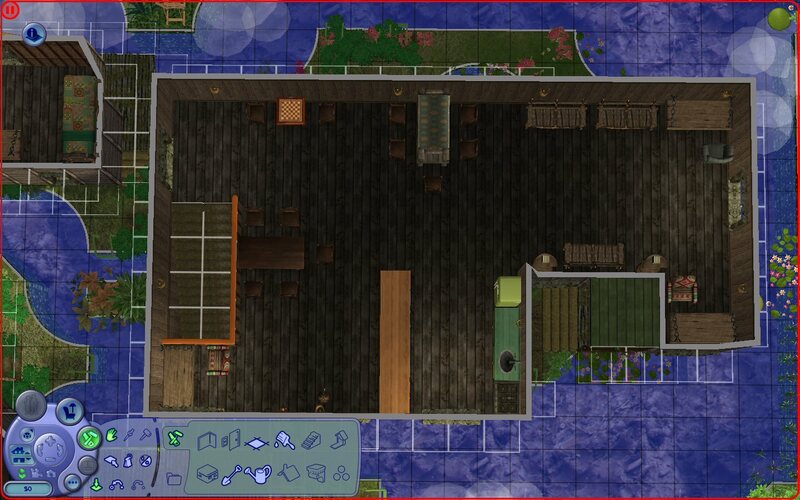 Papa Bear Shack (1 room, 3 students), Second Floor. Baby Bear Shack doesn't have a second floor. 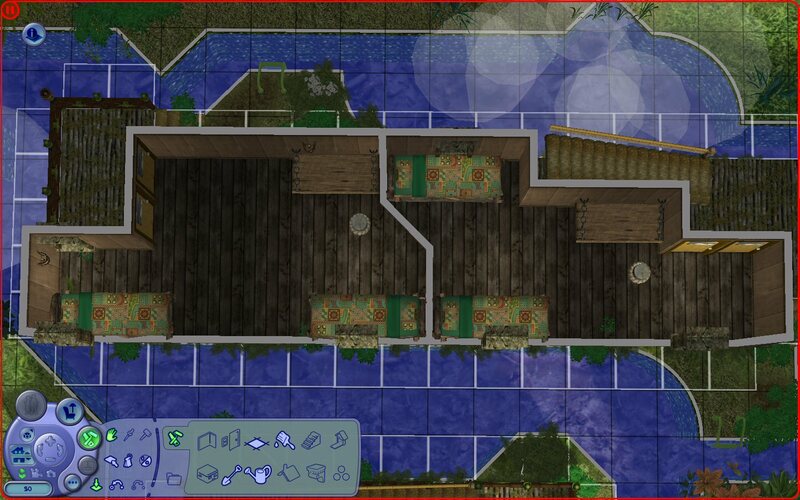 Mama Bear Shack (2 rooms, 2 students each), First Floor. 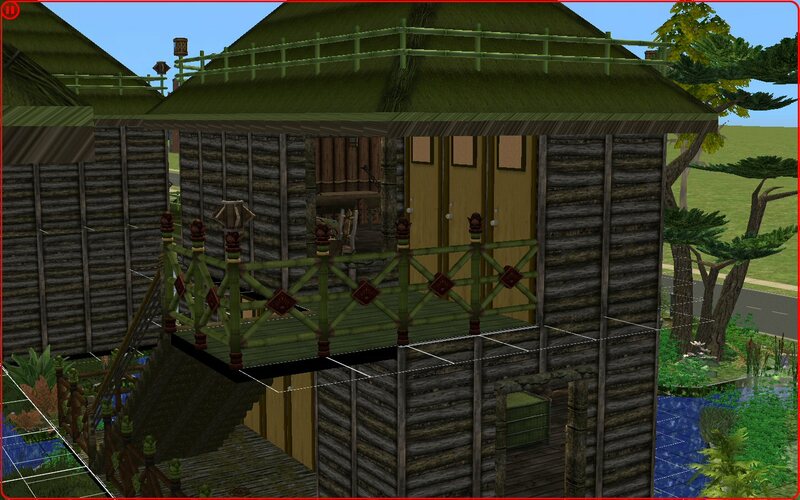 Mama Bear Shack (2 rooms, one for 2 students + one for 1 student), Second Floor. Front View: All four buildings, sans roofs. Rear View: All four buildings, sans roofs. 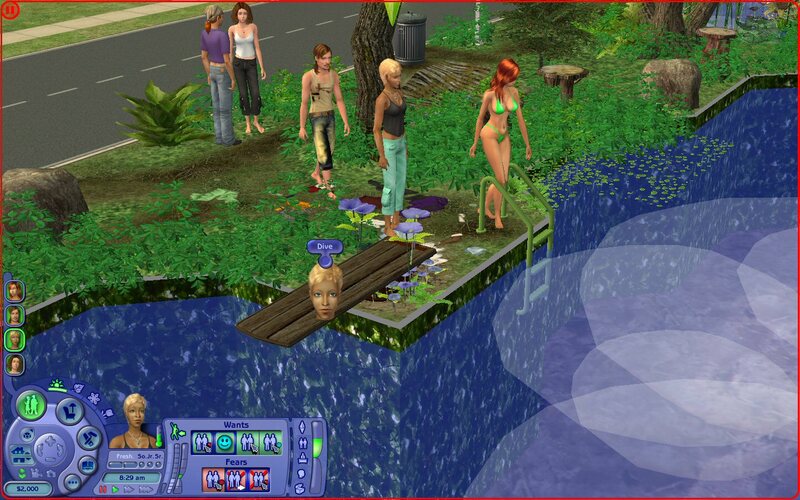 • Sims can't swim and carry assignments at the same time, neither. But every building has at least one desk with a dining chair. And if anyone's dumb enough to pull out an assignment on one of the land masses which have no buildings or desks, then they deserve what they get and their dumb butts will have to sit in the dirt to do their homework. 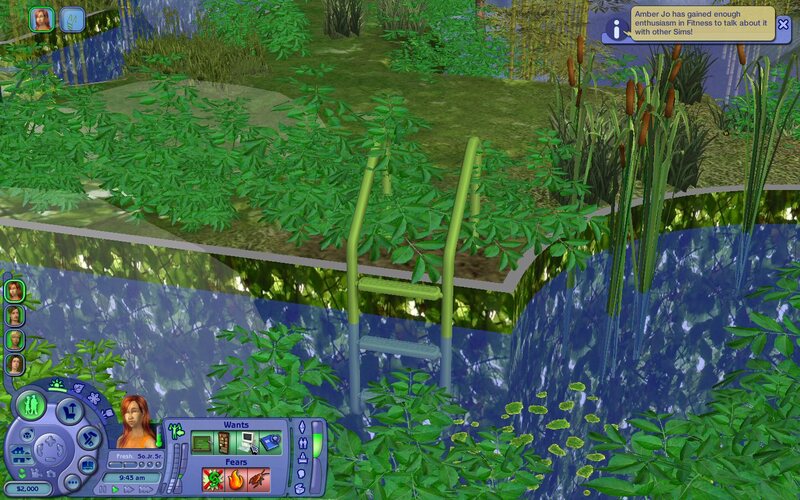 • Sims can usually walk through plants in the Flowers menu, but can they still use pool ladders and diving boards when those fixtures are thick with Flower plants? • I don't see any paintings or other art! Add some for quick Fun boosts when needed. Make it setting-appropriate; carved wooden bears are okay, marble Venus busts are out. • Sims can't swim quite as fast as they can walk, skip, run or fly in vampire bat form. That's not really a problem, though...more like a challenge. After all, I've put five zombies through college! If that doesn't teach someone how to manage their time effectively, nothing will. PROTIP: You know that trick where you wait until the Final Exam's 90 minutes done before you send your Sims running off to it? Don't try that stunt here! • Seriously. Is this lot a swamp, or is it more like a bayou? Can I get an authority to weigh in here? 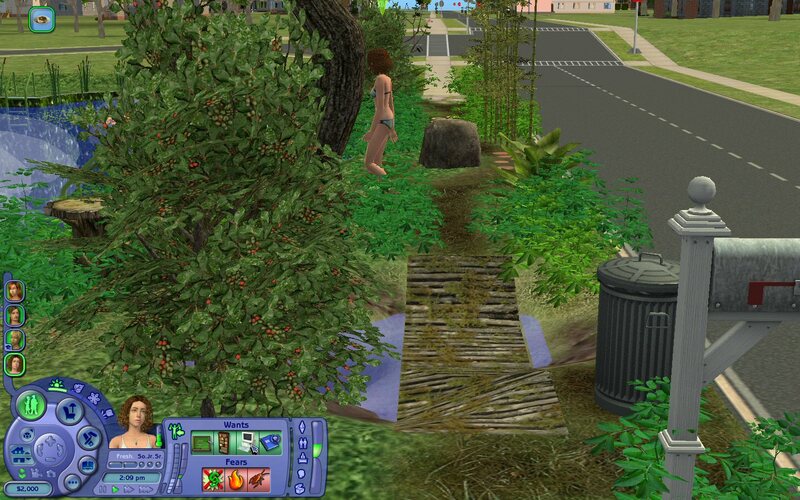 ...and those concerns — and more* — are why I'm sending these swamp-friendly Sims in to check things out. * Not counting the swamp/bayou thing. No Sim on SimEarth can solve that one! But I'm up past my bedtime, so...see you tomorrow? That last post is just hairs from hitting the 10,000-character limit, and no one else is chiming in yet. So y'all won't mind if I leave this update here, will you? Welcome to the Fens, you crazy little swampbillies! Now go pick your dorm rooms! Okay, first test: Plant-choked diving board. Can Sims still use it? Obviously, using Move_Objects to impose trees or shrubs through your diving boards isn't the best idea; aside from blocking the diving boards, it would also look a bit bizarre. But Flowers-type plants are okay. If you don't take a weed eater to them every now and then, grass, ivy and flowers will swallow anything. Apparently, diving into algae and lilypads is no big deal. Also, more weed-choked diving boards. I was expecting those Cloud Ruler Temple clouds to look better once I started playing the lot in Live Mode, but they don't. They also completely cover any Sims swimming through the clouds, so you can't click on the Sims or even just mouse over them. 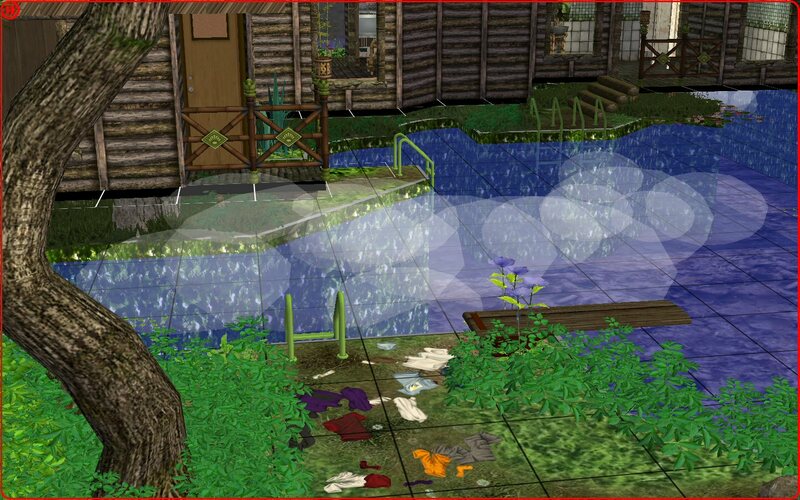 I wonder if there are any better cloud and mist objects for TS2. I'll have to Google around. 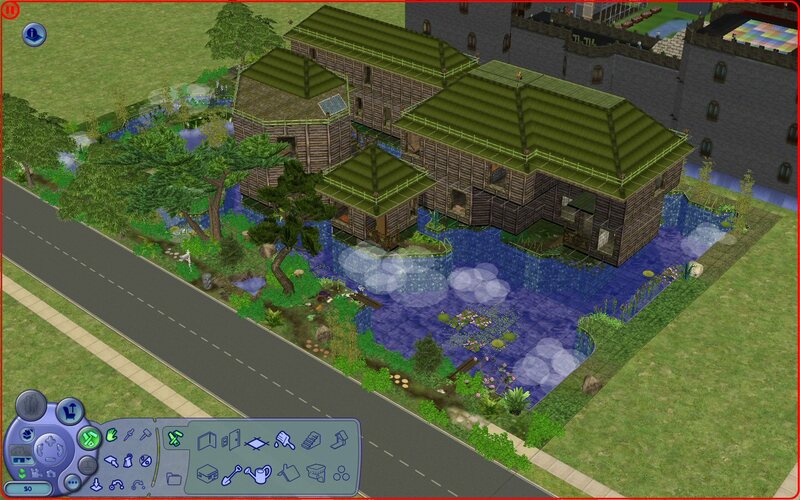 The good news is that Sims can swim under algae and lilypads. The bad news is that, on closer inspection, it turned out that the water plants are actually hovering several Simmy inches above the surface of the water. 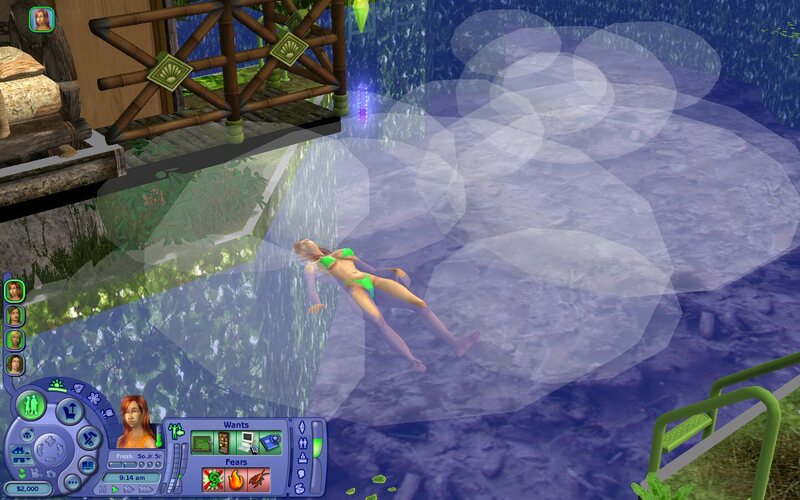 So Sims aren't really submerging themselves to swim under them; it's easy to swim under a water plant when it's self-levitating. It's a nice illusion, though. It's probably related to a problem I encountered in Build Mode with this lot yesterday: The game's engine counts the surface of the water in swimming pools as being solid, which scuttled my idea of covering the bottom of the swimming pool with rocks, faux freshwater kelp and half-submerged trees. 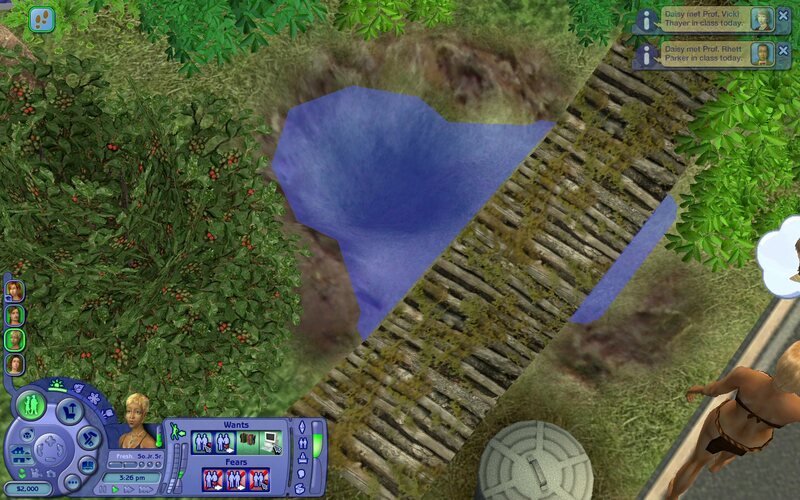 You can do that with Terrain Tool pools, but not with swimming pools. It's a bit disappointing, really. Next test: Plant-choked pool ladder. Can Sims still use it? ...both fishin' holes work as intended. There are one or two spots by each fishing hole where the vegetation blocks fishing, but that's not enough to matter much. And this random dormie just did another one of my tests for me! Plant-choked steps? Still useable. Which reminds me: Have you ever stepped on a mossy, waterlogged, slimy log with your bare feet? I have. It feels kind of gross, but not in an unpleasant way. Weird, right? I haven't found any points in the canals where it looks like Sims should be able to pass but can't, so the canal system seems to be okay. There are a few narrow chokepoints (like what Marsha's swimming though there), but with a lot of this size — and with only 14 students and a few visitors on the lot — that shouldn't be much of a problem. Holy Zeus, those Body points! My swimmy Simmies are just racking them up! ...to llama mascots. Everyone. Swims. I haven't seen any cow mascots, professors, hobby instructors, firefighters or police officers swimming around yet, but I did see a streaker already. Streakers skinny-dip, which makes sense, since they're stark naked and they obviously didn't bring any swimsuits. No, I'm not showing you those screenshots. Oh, Craig wants to meet someone new and to make a new friend? No problem! It turns out that while I was tinkering around with ConstrainFloorElevation and the Terrain tools, I made this sidewalk-replacing stick path uncrossable, forcing Sims to walk into the street to get around it. I'll have to fix that. 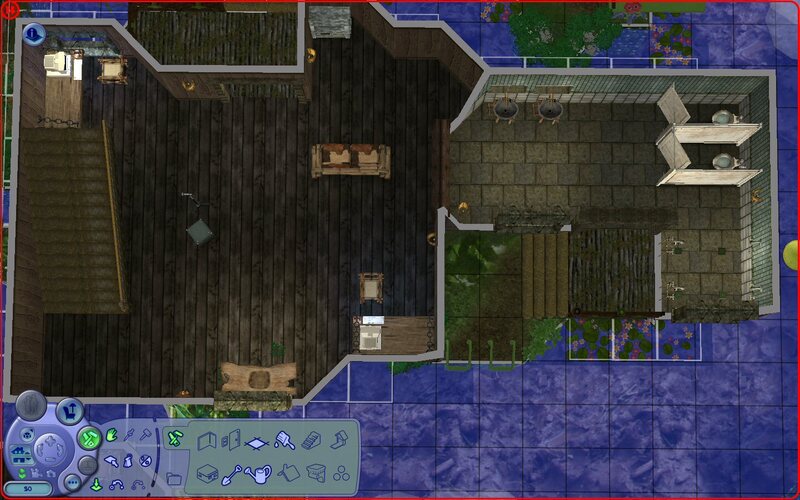 I probably just set one of the grid points too low, but really, Sims! There's not even enough water on that stick path to get your feet wet! What's up with that? Daisy also took the opportunity to remind me that those Parsimonious plants were cloned from flowers. How does that grass smell, Daisy? And then Daisy hogged the entire TV couch because she's a jerk. Willow just wants to sit down and watch the Sports Station with you, Daisy! Is that so wrong? Also, the study works as intended. One big problem that I noticed was that I don't have nearly enough pool ladders at the sidewalk edge of the lagoon, just the one next to that diving board. This results in a massive bottleneck as a bunch of Sims show up on the lot, walk to the mailbox and then try to swim to the buildings all at once. And all that pathfinding goes haywire from there. Even in those third and fourth screenshots back there, with Daisy on the diving board and Amber Jo just getting free of the ladder, Craig and Marsha had to wait their turn, which caused them to drop their queue. I manually directed Marsha around to the other diving board, but Craig still had to wait. When acting autonomously in going from Point A to Point B with a swimming pool in the way, Sims usually won't consider diving boards and pool slides as means of entering the pool; they'll just look for the pool ladders. And slides and diving boards don't provide exits from the pool, of course. So, more pool ladders will be needed. I'll set about four or five more pool ladders on top of some weeds and call it done. Other than that, everything seems to be working so far. What do you think? OK first of all so not doing one for my Uni hood. That said if you place The Trash things from the Commercial set of Buy Objects, sorry I forget what those things are called, they eliminate the need to empty the trash from them. So maybe that could help? Also you could use the composters things from gardening and if the compost is not used, then sell the compost. 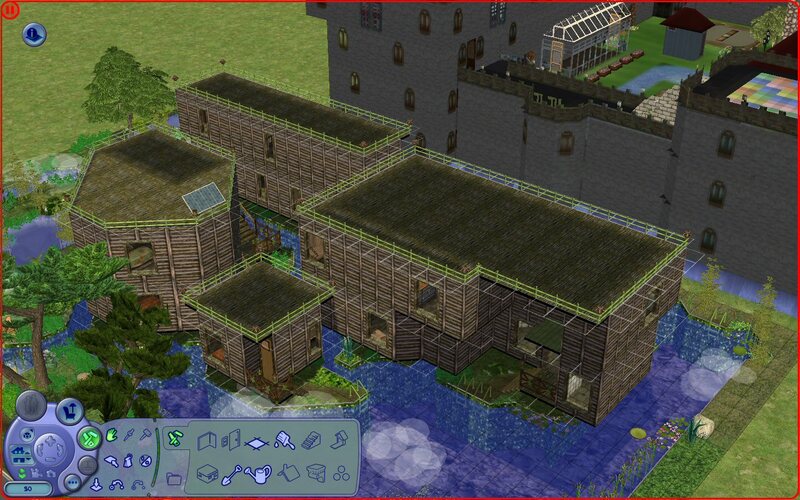 Also you may like a mod by Inge Jones on simlogical it is ijPoolLadderPatch_BV, works with FT and AL. Makes the Maxis pool ladder autonomous, and advertises especially to Sims who are overheating. (13-10-2018 06:08 PM)lordtyger9 Wrote: OK first of all so not doing one for my Uni hood. No swimmy Simmies and mega Body points for you? Okay. (13-10-2018 06:08 PM)lordtyger9 Wrote: That said if you place The Trash things from the Commercial set of Buy Objects, sorry I forget what those things are called, they eliminate the need to empty the trash from them. So maybe that could help? Also you could use the composters things from gardening and if the compost is not used, then sell the compost. It may be worth noting that you can't sell a compost bin's compost reserves in the base game; you need a mod to do that...for example, this one. BO can toot his own horn here. But a Community trash can or three would also help. I'd have to convert the lot from Residential to Community, add the trash cans and then convert it to Dorm, but it's doable. I'll try that. (13-10-2018 06:08 PM)lordtyger9 Wrote: Also you may like a mod by Inge Jones on simlogical it is ijPoolLadderPatch_BV, works with FT and AL. Makes the Maxis pool ladder autonomous, and advertises especially to Sims who are overheating. 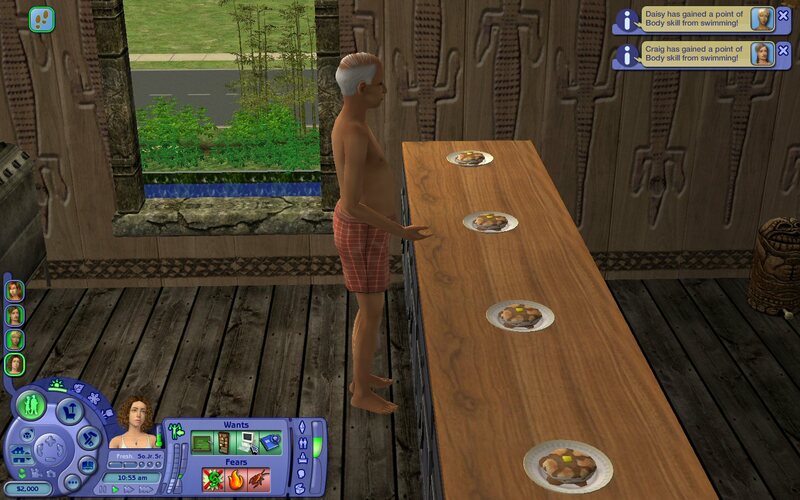 It sounds like a mod that would eliminate Sims always choosing the diving boards over the pool ladders, which is particularly annoying if the Sim persistently stands on the end of the diving board, chickens out and backs off the diving board, only to autonomously try again moments later. Just use the pool ladder, you coward! I could! But there is no need. My horn has been sufficiently tooted already! Because, apparently, the both of you are aware of this feature of my mod, proving that both of you have -- at least at one time --, used it! What more advertising does one need?